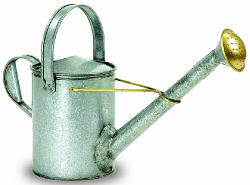 One of several small and large watering cans offered by ACHLA Designs, this 18th century replica watering can hold 1.5 gallons. Available in short and long neck options. Made of galvanized steel. This 18th century replica watering can hold 1.5 gallons.